The Township of Georgian Bay makes up part of the District of Muskoka, located in south-central Ontario, Canada. The Township of Georgian Bay is located on the Severn River, where the Severn River empties into Georgian Bay. The municipal offices for the Township of Georgian Bay can be found in the town of Port Severn. The population of the Township of Georgian bay as of 2011 is 2,482. Georgian Bay township is the administrative centre of the Moose Deer Point Ojibway First Nation reserve. Georgian Bay is about 190 km long by 80 km wide. It covers approximately 15,000 square kilometers, making it nearly 80% as large as Lake Ontario. Eastern Georgian Bay is part of the Southern edge of the Canadian Shield, granite bedrock exposed by the glaciers at the end of the last ice age, around 11,000 years ago. The granite rock formations and windswept pines are the characteristic of the islands and much of the shoreline of Georgian Bay. The rugged beauty of the area inspired landscapes by artists of the Group of Seven. The western part of the bay, from North of Collingwood, and including Manitoulin, Drummond, Cockburn and St. Joseph islands, borders the Niagara Escarpment. Georgian Bay is sometimes called the "sixth Great Lake". There are tens of thousands of islands in Georgian Bay. Most of these islands are along the east side of the bay and are collectively known as the "Thirty Thousand Islands", which includes the larger Parry Island. Lying along the Northern side of the bay is Manitoulin Island and it is the world's largest island in a freshwater lake. The Trent–Severn Waterway connects Georgian Bay to Lake Ontario, running from Port Severn in the Southeastern corner of Georgian Bay through Lake Simcoe into Lake Ontario near Trenton. Further North, Lake Nipissing drains into Georgian Bay through the French River. In October 2004, the Georgian Bay Littoral was declared a Biosphere Reserve. Georgian Bay is a part of Lake Huron, located within the province of Ontario. The main body of Georgian Bay lies East of the Bruce Peninsula and Manitoulin Island, and to its Northwest is the North Channel. Georgian Bay is surrounded by the districts of Manitoulin, Sudbury, Parry Sound and Muskoka, as well as the more populous counties of Simcoe, Grey and Bruce. The Main Channel separates the Bruce Peninsula from Manitoulin Island, and connects Georgian Bay to the rest of Lake Huron. The North Channel was once a popular route for steamships and is now used by a variety of pleasure craft to travel to and from Georgian Bay, which is located between Manitoulin Island and the Sudbury District, west of Killarney. The shores and waterways of the Georgian Bay are the traditional domain of the Anishinaabeg First Nations peoples to the North, and the Huron-Petun (Wyandot) to the south. The bay was a major Algonquian-Huron trade route. Samuel de Champlain, the first European to explore and map the area in 1615–1616, called it "La Mer douce" (the calm sea), also a reference to the bay's freshwater. It was named "Georgian Bay" (after King George IV) by Lieutenant Henry Wolsey Bayfield of the Royal Navy in 1822. There is a strong Aboriginal presence in the Southern regions of the Canadian Shield dating from 11,000 years ago. Evidence of settlements have been found on Manitoulin Island and near Killarney. At the time of European contact, the Ojibwe and Ottawa First Nations, both of whom call themselves Anishinaabe, lived along the Northern, Eastern and Western shores of Georgian Bay. The Huron and Tionontati inhabited the lands along the Southern coast, having migrated from the northern shores of Lake Ontario. Names of islands such as "Manitoulin" and "Giant's Tomb" are evidence of the richness of the cultural history of the area. Aboriginal communities continue to live on their territories and practice their cultural traditions. The first European people to visit the area was in1610 with the Onontchataronon, an Algonquian people of the Ottawa River. They traveled every winter to live with the Arendarhonon people of the Huron confederacy at the Southern end of Georgian Bay, in the area now called "Huronia". In 1615 the French explorer Samuel de Champlain, made a visit to Georgian Bay and overwintered in Huronia. He was preceded that summer by a Récollet missionary, Joseph Le Caron, who would live among the Huron in 1615–1616 and 1623–1624. Another Récollet missionary, Gabriel Sagard, lived there from 1623–34. The French Jesuit Jean de Brébeuf began a mission in Huronia in 1626. In 1639 he oversaw the building of the mission fort of Sainte-Marie, Ontario's first European settlement, at what is now the town of Midland. The reconstructed Jesuit mission, Sainte-Marie among the Hurons, is now a historic park operated by the province of Ontario. Nearby is the Martyrs' Shrine, a Catholic church dedicated to the Canadian Martyrs, Jesuits who were killed during Iroquois warfare against the Huron around Georgian Bay in the 17th century. Penetanguishene, an Ojibwe village located at the Southern tip of the bay near present-day Midland, was developed as a naval base in 1793 by John Graves Simcoe, first Lieutenant Governor of Upper Canada. In 1814, during the War of 1812 between Great Britain and the United States, one of the battles was fought in southern Georgian Bay. On August 17, at the mouth of the Nottawasaga River near Wasaga Beach, the British schooner HMS Nancy was sunk by three American vessels. Several weeks later, Nancy was avenged when British boarding parties in the De Tour Passage surprised and captured two of the three American vessels. Georgian Bay was first charted in 1815 by Captain William Fitzwilliam Owen, who called it Lake Manitoulin. Captain Henry Bayfield, who made more detailed charts of the bay, renamed it in 1822 after King George IV. His charts are the basis of those in use today. Legend tells of a God called Kitchikewana, who was large enough to guard the whole of the Georgian Bay. Kitchikewana was known for his bad temper, and his tribe decided the best way to calm him was with a wife. They held a celebration, and many women came. Kitchikewana met a woman named Wanakita here. He decided that this was the woman he wanted to marry, and started planning the wedding immediately after she left. But when she was invited back, she told Kitchikewana that she was already engaged. Enraged, Kitchikewana destroyed all the decorations, running to one end of Beausoleil Island and grabbing a large ball of earth. Running to the other end, he tossed it into the Great Lakes. Thus, the 30,000 Islands were created. The indentations left behind by his fingers form the five bays of Georgian Bay: Midland Bay, Penetang Bay, Hog Bay, Sturgeon Bay, and Matchedash Bay. He then lay down to sleep and sleeps there still as Giant's Tomb Island. The town of Penetanguishene now has a large statue of Kitchikewana on its main street. 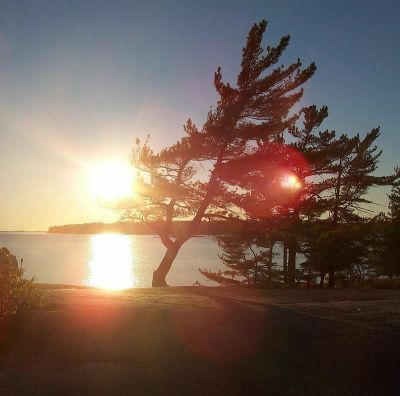 There is a YMCA summer camp for youth located on Beausoleil Island, in southern Georgian Bay, named after Kitchikewana. YMCA Camp Kitchikewana, or Kitchi for short, has been located in Georgian Bay Islands National Park since 1919. The largest part of Georgian Bay is Owen Sound, having served as a shipping and rail depot for the Upper Great Lakes. The towns of Midland, Penetanguishene, Port Severn, and Honey Harbour are at the Southeastern end of the bay and are popular sites for summer cottages, as are the many bays and islands on the Eastern Coast. Collingwood, Meaford, and Wasaga Beach are located at the Southern end of the bay, around Nottawasaga Bay. Owen Sound, Wiarton, and Lion's Head are located on the Bruce Peninsula along the Southern and Southwestern shores of the bay, while Tobermory is located at the Northern tip of the Bruce Peninsula on the Main Channel. Parry Sound has the world's deepest freshwater port. There are communities of summer cottages on the North and East Shore and on the adjacent 30,000 Islands. These include areas such as Cognashene, Wah Wah Taysee, Sans Souci, Pointe au Baril and Byng Inlet. Many cottages on Georgian Bay are only accessible by water.